The Russian Movement of Development suggested New Middle East, a new geopolitical project. Founders of the movement maintain that Russian diplomacy should propose establishment of a new region that will comprise Russia, China, Afghanistan, Mongolia, Azerbaijan, Turkey, Pakistan, and Central Asian countries. Industrialization of Afghanistan and Central Asian states will become Russia's number one task within the framework of the project. Yuri Vasilievich Krupnov, chairman of the Movement of Development and Supervisory Board of the Institute of Demography, Immigration, and Regional Development, is prime ideologist of the new project. He believes that Russian foreign policy should be offering its post-Soviet neighbors export of development rather than export of democracy. "The Soviet Union became an ultimate accomplishment of development. We should feel awe when analyzing this period. We are neighbors with Afghanistan and Central Asian countries. Sure, it is possible to try American technologies and techniques, say from Texas, but I don't think that it will be particularly rewarding. At least because a flight to Kabul from Texas is vastly more expensive than from Novosibirsk or Dushanbe. Moreover, our technologies and techniques are cheaper and simpler. Even though 30,000 American automatic rifles are to be bought for the Afghani regular army in 2009, most Afghanis prefer Kalashnikov assault rifles," Krupnov told Ferghana.Ru. Krupnov said that Russia should industrialize Central Asian countries and Afghanistan to facilitate economic development of its own Siberia. "That should be the central principle of industrial development - develop neighbors to facilitate our own development. Besides, development of the countries in Russia's southern underbelly is a must if we want to develop and stop depending on oil prices and global crises. After all, this is a matter of our own security and our own survival. All fundamental threats to Russian development mostly stem from Afghanistan, these days. Up to 90% junkies in Russia are hooked on Afghani opiates. Drugs become an increasingly worse threat to the Russian youth and to the population of Russian industrial centers in general. Pseudo-Islamic schools threaten Russia from Afghanistan. NATO and US military bases take Russia in a ring. It is necessary to react to all these threats of course, and so colossal reserves are expended to intercept drugs, thwart terrorism, and maintain geostrategic parity with the United States and NATO," Krupnov said. "By and large, Afghanistan is the prime target of the project I suggest," Krupnov explained. "Disintegration of the USSR began with failure of the military operation in Afghanistan. Restoration of Russia should begin with industrialization of Afghanistan. We failed there years ago because there was really nothing we could offer them or ourselves for that matter. 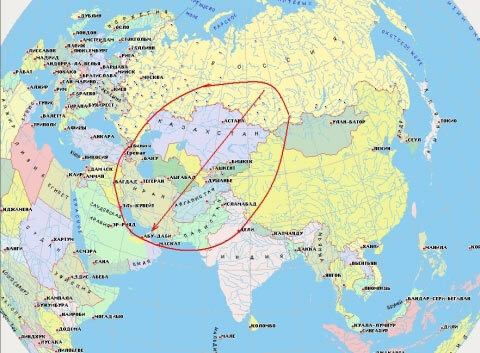 We decided that once we withdrew first from Afghanistan and then from Central Asia and the Caucasus, we would pen ourselves in and know no problems anymore. We have no choice anymore. Seven years of US and NATO military presence in Afghanistan almost tripled drug production in this country." Click here to see unabridged text of the interview with Yuri Krupnov (in Russian).